your wreath turned out great!! and you are right, it looks perfect on the green door! This is beautiful!! I love the rosettes. This week is my blog anniversary and to celebrate I'm hosting a week's worth of giveaways. I hope you stop by! This is soooo darn cute!!! Thanks so much for sharing the idea and your talents! Is that a clemson tiger paw? I love Clemson and I love your wreath! I am highlighting that somedaycrafts.blogspot.com. Grab my "featured" button. This is super cute! I think I might have to try to make one for my home. I love how simple let classy it looks! I love your wreath! It's such a creative idea. Love the wreath- the burlap rosettes are adorable!! So cute and perfect for fall! I love the rolled burlap flowers! Those burlap rosettes are to die for. They'd be cute on a Country Christmas tree, too! Love the wreath!! It looks perfect on your front door too...and I agree, the green door is perfect too :-). Great job! I love your green front door too! 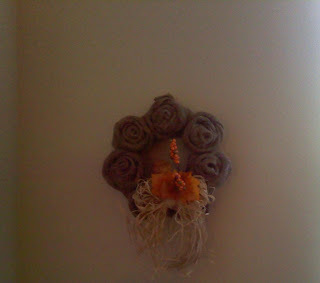 The burlap wreath is great against it!! I really like it!! This is such a great fall wreath. Thanks for sharing. So simply gorgeous! I'm beginning to think I have a wreath obsession and this is NOT helping-in the best way! This is so cute! It looks like a Cinnabun wreath. Beautiful! I love it and you did a great job. Visiting from the Girl creative. I love it! I have never seen a wreathe done like that, very unique! wonderful!!! i can't wait to try it. HI--just wanted to let you know I linked to this on our Three Sisterz FB page. Thanks!! Love it! I love it so much that I featured it today! Come check it out! Hi! I found your blog thru the cool site Someday Crafts. Awesome wreath! I'm lovin' burlap more I more! thanks for posting this! Your wreath is very cute, but I LOVE the front door color. Do you know what paint color it is? Please share if you do. Thanks for posting.